When you critically observe all the commands above, the little trick is using the -o option in the find command, it enables you to add more filenames to the search array, and also knowing the filenames or file extensions you are searching for. In this guide, we covered a simple yet helpful find utility trick to enable us find multiple filenames by issuing a single command. To understand and use find for many other vital command line operations, you can read our article below. How to find all .cpp files which consist of sub string shares in the file name? How to use the find command to search for a file with a range of dates? For more information, see the find man page. # find . -type f | egrep -i "[.]sh$|[. ]txt$"
Useful tip, thanks for sharing. seems to be way simpler. That works but it may not be efficient and reliable enough for the job, especially when you want to search in several locations. “ls” works only for current directory content listing. It won’t search files recursively in any sub directories if available. So, we need to use find command only which will search in sub-directories also. 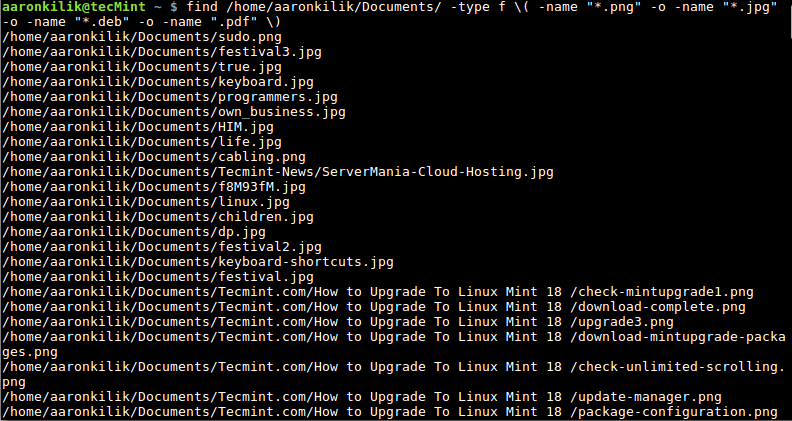 The above command find all files with xml or txt extension. Thanks for the great tip, If find it really very useful commandline trick to achieve the same results, hope it will be useful to others..